"It's improved our business significantly!" "We love it. 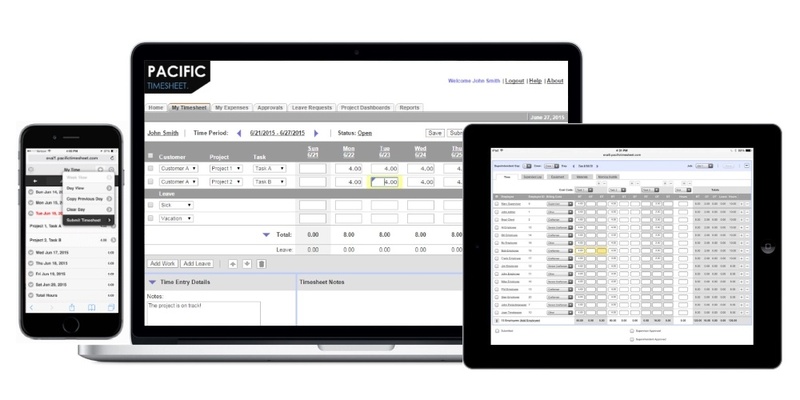 Pacific Timesheet is so easy to use!" Any rules: overtime, accruals, and more. Any integrations: payroll, accounting, SSO. Full customer support during trial. In this trial get everything you need to test Pacific Timesheet: every kind of timesheet, time off, expense, approvals, reporting and integration. During your free trial we give you full support as if you were a paying customer. Schedule a free trial system initial setup with an application specialist. Pacific Timesheet is fast and flexible. Setup timesheets, forms, policies, and reports quickly. Test. Buy. Rollout. Move fast.